Construction site dumpster rental is integral to maintaining efficiency, and finding a reliable solution for your dumpster rental needs should be a top priority for any business. Because construction site dumpster rental is likely to be a recurring need, taking time now to solve some potential problems will set a precedent for professionalism in projects to comes. Good dumpster rentals are built on communication. This can be a killer for successful dumpster rental. When you get in touch with a dumpster delivery professional, make sure you iron out all the details explicitly. That means dumpster dimensions, delivery window and duration, as well as price estimates. Construction sites have deadlines and need to collaborate with punctual delivery services in order to honor those deadlines. Knowing your jobsite backwards and forwards is the best way to avoid critical mistakes. Making arrangements for a dumpster to be delivered is pointless if you don’t think about the size you need beforehand. Having a small dumpster means multiple trips and a serious blow to time efficiency. Having a large dumpster might mean you incur additional costs that you could have avoided. Either way, your jobsite is negatively affected. It’s also good to get a basic weight approximation on the full dumpster as it will need to be hauled off-site. Sidewalks and driveways have weight limits, and working with heavy materials needs to be taken into consideration to avoid damages. Dumpster placement on the jobsite is critical. One of the most important prep steps for dumpster delivery to a working jobsite is coordinating dumpster placement. Having a predetermined placement that adheres with street and safety regulations is essential. It also helps if the placement is conveniently located near disposal materials, for optimum efficiency. Know the local street regulations beforehand so you don’t incur fines for blocking traffic or inconveniencing nearby residents. Know how long you need to rent your dumpster? Think carefully about the rental duration and what level of waste pickup can be accomplished in that time frame. Is it enough time to get your construction site cleaned up? If you don’t take this factor into consideration you may be charged extension fees or simply lose access to the dumpster before you have completed your task. How can you get the best price on dumpster rentals? The dumpster rental fee needs to be incorporated into your overall jobsite budget. Don’t let this detail slip through the cracks! 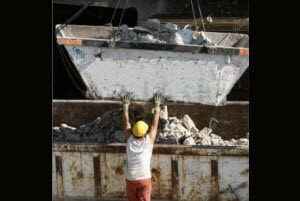 Getting a quote for the correct dumpster size should happen early in the construction process. The maximum weight capacity of the dumpster will more accurately determine the price, rather than basic dimensions. You can avoid these problems and set up your construction site for success by working with the right dumpster rental service. Click here to get more information about construction site dumpster rental from the pros at Rolloff Dumpster Rental Solutions today.